NPR has issued a formal apology to Abigael Evans, the 4-year-old Colorado girl who burst into tears—and Americans' hearts—while listening to a public radio report about the seemingly endless 2012 presidential election. "On behalf of NPR and all other news outlets, we apologize to Abigael and all the many others who probably feel like her," NPR said in a statement posted on its blog. "We must confess, the campaign's gone on long enough for us, too. Let's just keep telling ourselves: 'Only a few more days, only a few more days, only a few more days.'" 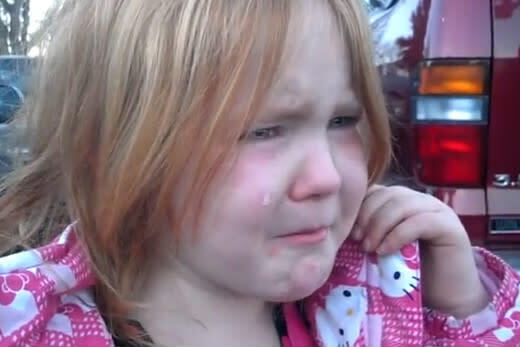 The video of an inconsolable Abigael telling her mom she's "tired of Bronco Bama and Mitt Romney" has racked up more than 1.5 million views since Tuesday, when it was posted on YouTube. Not to worry. Grace Hood, a reporter for NPR Colorado affiliate KUNC, reports that Abigael is now happy thanks, in part, to an NPR Politics pin given to her by the station.